In What Ways Are Personal Learning Networks Having An Effect On Education? Edchat - a great PLN!! We are very grateful to Andrew Barras (@crudbasher) for this week’s summary of what was another very lively discussion on #edchat and a topic which most people felt very passionate about! Andrew is very passionate about technology and the role that it plays, and will play even more in the future, in education. He has provided a splendid definition of PLN and really captured the tone of the discussion! The rise of the Internet has allowed connections to be forged between people based on a common purpose, ideology or interest. This collection of people, ideas and concepts is completely customized and fitted to an individual’s needs. The term Personal Learning Network (PLN) is widely used to describe this system. While each PLN is unique, they all share certain features. They are not something that you join, the user has to create their own. Using Twitter, RSS feeds, Diigo, Delicious and blogs, people inquire, ponder, respond, and learn, usually all at the same time. There are no ranks, degrees, status or wealth. Only ideas. It is the ultimate democratic forum, where each person has a voice and each voice is equal. Like a plant, the PLN needs attention, feeding and sometimes pruning. More than the information gathered however perhaps the best reward for having a PLN is to provide a brutally honest sounding board for our thoughts and an encouraging support group when we struggle. It truly is more than the sum of it’s parts. General agreement that PLNs are having an effect. You don’t join a PLN you build (or grow) one. 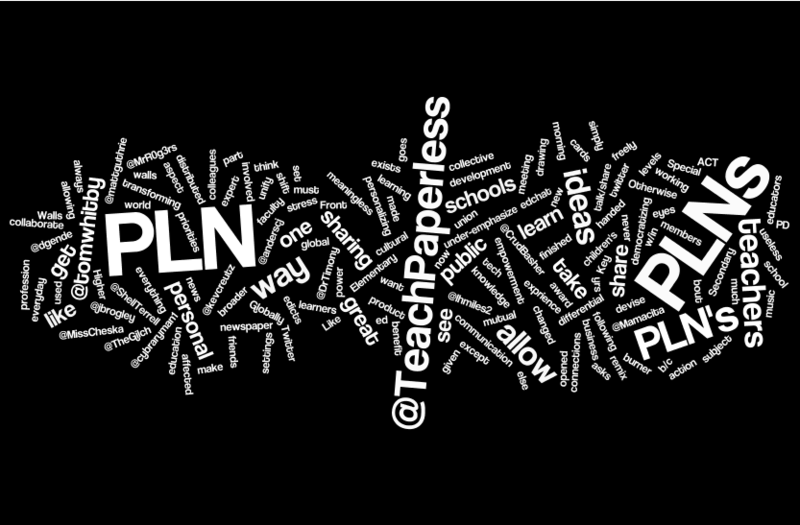 @TeachPaperless: PLNs are both democratizing and personalizing professional development. 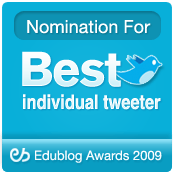 @cybraryman1: Where else could you have 24/7 PD from great global educators. PLN’s are transforming how we teach & collaborate. @anderscj: @kevcreutz PLN members set their own priorities and make connections of mutual benefit, edicts are handed to no one. @MissCheska: There is no power differential in PLNs – knowledge is freely distributed, allowing for empowerment in all levels. @Mamacita: When each subject exists only w/in 4 walls of one classroom, they’re useless. PLN’s allow communication & sharing. @CrudBasher: Having a PLN is like having an expert team working for me everyday. @thenewtag: Twitter is my newspaper each morning and night. It’s opened my eyes to a whole new world of learning. @tomwhitby: PLN’s allow the blending of ideas from Elementary, Secondary and Higher ed settings. 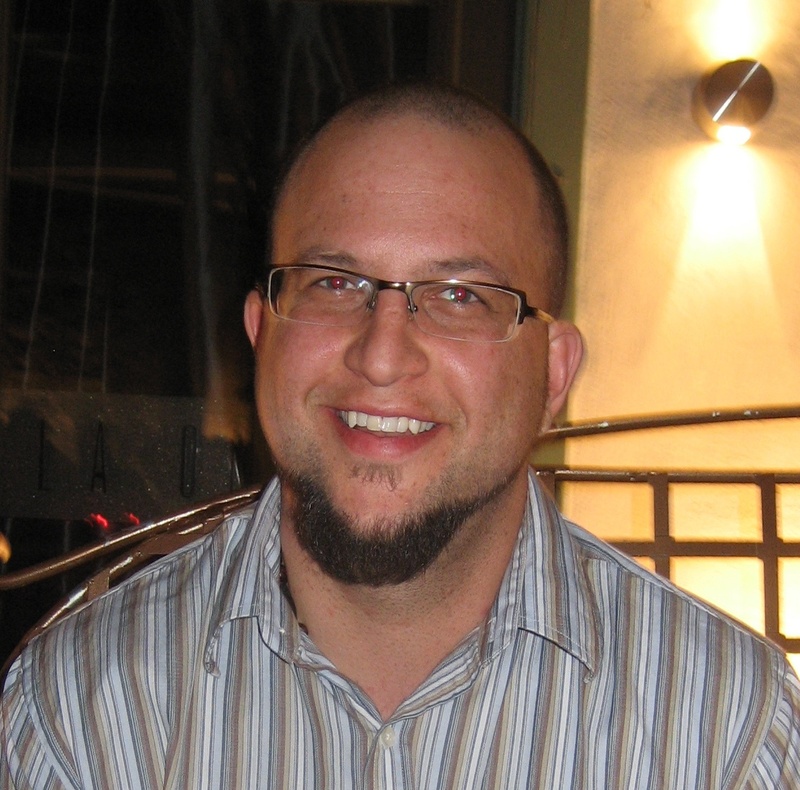 @jbrogley: My PLN has also changed what I want for my own children’s education. @TheGilch: If you are following 20 teachers on twitter, think of how much collective exprience you r drawing from! @TeachPaperless: A great way to get teachers involved in PLNs is to under-emphasize the ‘tech’ and stress the sharing aspect. @tomwhitby: PLN’s allow us to not only devise ideas, but share the finished product Globally. No Walls! @DrTimony: Front burner task for PLN must be to unify colleagues and schools. Like a union except with brains. @TeachPaperless: PLNs are part of broader cultural shift; see: news, entertainment, gaming, music industries – remix of personal/public hierarachies. @dgende: When faculty asks: how did you know ’bout this? How did you learn this? I take the opportunity to pitch PLNs! @lhmiles2: Key w/ PLNs is to always take action. Don’t simply talk/share ideas. ACT. Otherwise, meaningless. @TeachPaperless: PLNs have made the profession personal in a public way and public in a personal way. Is the public education system broken, or is it actually working exactly like designed, but the design is bad? Stay Connected at #ISTE10 (Whether you’re attending or not!) http://is.gd/cZogk. My name is Andrew Barras (aka Crudbasher). I am honored to be able to provide the summary for #edchat this week! I am an Instructional Designer at Full Sail University in Orlando, Florida. I have been a 3d Modeler, Computer Programmer, Web Designer, and Professor over the last 15 years. I was even making Military Simulations before I could legally drink! (that was a disadvantage). Now I am adding Educational Futurist to my skill set. I have a BS in Digital Arts and Design and my Masters in Education Media Design & Technology, both from Full Sail University. I believe that Education is about to undergo a more drastic change in the next 10-15 years than it underwent in the last 100 because of technology. Therefore I blog at Education Stormfront where I focus on how disruptive technology will affect and change education in the next few years. How should critical thinking be integrated with technology﻿? Julie Shy (@shyj) has been this week’s #edchat ‘trooper’ and provided us with a great summary. You can read Julie’s bio at the bottom of the post. Her work with thinking skills, technology and teachers makes her a great candidate to tackle this week’s topic of critical thinking! I’m sure you will agree that it is a job well done! Critical thinking…..ahhhh….it sounds so “smart,” doesn’t it? We spend our days teaching our students how to ask good questions. We model and teach our students how to think critically. We spend hours showing our students how to take all of the wonderful information they have gathered and analyze and synthesize it. And then, the end of the school year comes, and our students take “the test.” You know which one I’m talking about…..”THE test”…..the only one the state looks at….the only one tied to budgets and recognition for your whole district…..the one that looks for ONE RIGHT ANSWER!!!! “Calgon, take me away!” C’mon, you know what I mean. Why should we, as educators, spend so much time on something that apparently isn’t valued by our educational system? Is it really worth our time and effort? @ShellTerrell: We need to make teachers feel comfortable w/ letting students find the answers instead of giving them the answers! @drdouggreen: Promote metacognition by having students self evaluate. @Ron_Peck: Move kids up the ladder of critical thinking and have them apply it in PBL or other student centered activity. @RushaSams: We need 2 understand power of scaffolding ques so that essential ones follow basic understanding, knowledge ones. @MissCheska: Doesn’t critical thinking require a little creativity? @Brian_ThomasTCI: Critical thinking often thrives in collaboration too. Grouping students fosters new thinking. @thenewtag: Not sure we even teach critical thinking as much as develop it by encouraging curiosity, experimentation and inquiry. 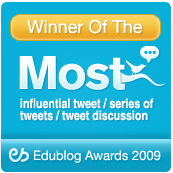 What technology tools specifically enhance critical thinking for students? 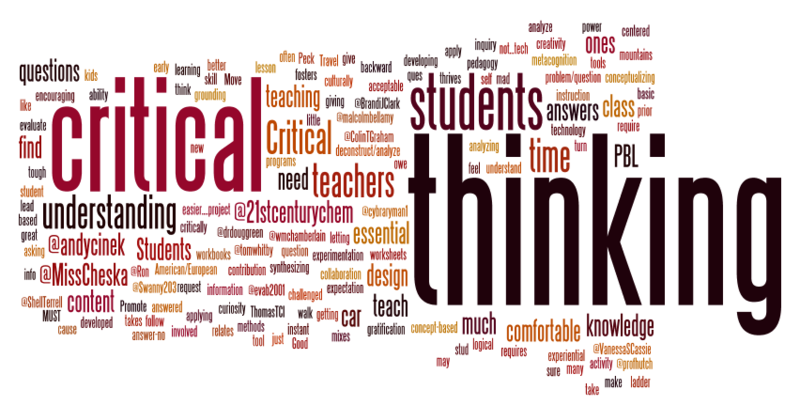 Brian_ThomasTCI: Teach Critical thinking with discussion strategy. Imagine this with Skype! http://bit.ly/daYxjr Other free assessment ideas linked. 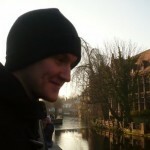 ColinTGraham: It’s worth looking at approaches like sketchcasting http://bit.ly/bEFCIU for presentations. Julie taught for 10 years before a friend saw an ad in the newspaper for an instructional specialist for the eMINTS program. She showed it to Julie and said, “That sounds like you.” Ten years later she is still working for eMINTS (thankfully!) and loving every minute of it! Helping teachers learn how to create a classroom community which embraces inquiry-based, high quality lessons, powered by technology, is something that is challenging and very rewarding. Not only does Julie impact teaching but she also gets to reach 100’s more students than she would have if she remained in the classroom. Julie is very passionate about education and her family, husband of 20 years, Rick and 2 kids (an almost 17 year old senior and 13 year old 8th grader, plus 2 dogs….and recently 6 puppies!…anyone need a weimaraner puppy? ), gardening, photography and trying to maintain a bit of sanity in her life! Prepositions – pearls of great price! I’ve been doing some work on prepositions lately and it struck me that for such insignificant little words, they have quite a powerful role to play in English language and seem to be a common bête noire at all levels of learning. So, I thought in this post I’d try to break down the uses, give some examples and see if we can’t engender a little respect for these feared yet very hard-working and versatile little words! Using prepositions in their simple form is fairly straightforward. Place – relationships are bound by position – on, in, under, above etc..
to show more, less, fewer than – we made just under/over £3,000! are used for rank or level – Sergeant is below the rank of captain. these are specific – I’ll meet you at the cinema (probably outside) or in the cinema (inside). It’s on the corner (the outside of the corner). It’s in the corner (surrounded, probably a Square or in a room). In with cities, countries etc.- in France but on with streets – I’m on North Street, at with named places – at Oxford Circus. At when people gather together – at a party, at the conference. towards shows the direction of the movement, up to usually indicates a purpose – I went up to her to get directions. indicate the start and end time – I’ll be here from Monday to Friday. (note American English often uses just through) I’ll be here Monday through Friday. The American usage tells us that Friday is included in the stay the British version is less clear. Bound prepositions are dependent upon certain words (or the words ‘take’ a certain preposition). These prepositions have no independent meaning as meaning is conveyed by the word/s to which they are bound. It is important to learn these and commit them to memory as you come across them. Where the object is a verb – it is often in the …ing form – They accused him of lying. With adjectives describing emotion then ing form or infinitive with to is possible. They were angry at seeing animals mistreated. They were angry to see animals mistreated. These multi-word combinations are called prepositional verbs. Here are a few examples – complain to, rely on, confide in, part with, look into etc..
Another verb + preposition combination is the phrasal verb – these are different because the meaning is changed completely with addition of the preposition, which is not the case with prepositional verbs. Here are some examples – look up to, hand over to, get out of, put up with, get back to, come out of etc…. Their success in getting the contract was the turning point in the life of the company. She had always had a fear of spiders. She had feared spiders from childhood. They were very anxious about the merger. We could sense their anxiety about the merger. I’m not keen on the blue one. She’s quite nervous about tomorrow. Complex prepositions are always free prepositions but need support. Although their meaning combines with that of the other word/s they rely on these other words, which go in front. Some have such low self-esteem that they require a larger support team! In this last group they are hardly visible amidst their entourage ! Our final example in this woeful tale of prepositions is the stranded preposition. It stands alone at the end of a sentence or clause. In questions – Who are you applying to work with? In the passive – What percentage can the cost be reduced by? Relative clauses – Yesterday I saw that woman (that/who) you introduced me to! Infinitive clauses – She managed to see the film that it is impossible to get tickets for! Don’t forget to check your grammar book for more detailed information! Despite their sorry state prepositions can form interesting and very common idioms which you might want to consider adding to your vocabulary. Prepositions certainly do need some respect and it is worth spending time to study and learn how to use them well – it is one of those niggling areas of grammar which, if mastered, can make a big difference to your language performance! How do teachers get a seat at the education policy table? Politics and education seem to me to make uneasy bedfellows. Watching and participating in #edchat it felt like the start of something. I’m a fairly new teacher but already I can see a world of difference between the realities that teaching professionals deal with and the view that policy makers have of the educational landscape. This can be summed up by the fact that in the UK the previous Secretary of State for Education was an economist and the current encumbent a journalist. How much can these people really know about education and educational systems? 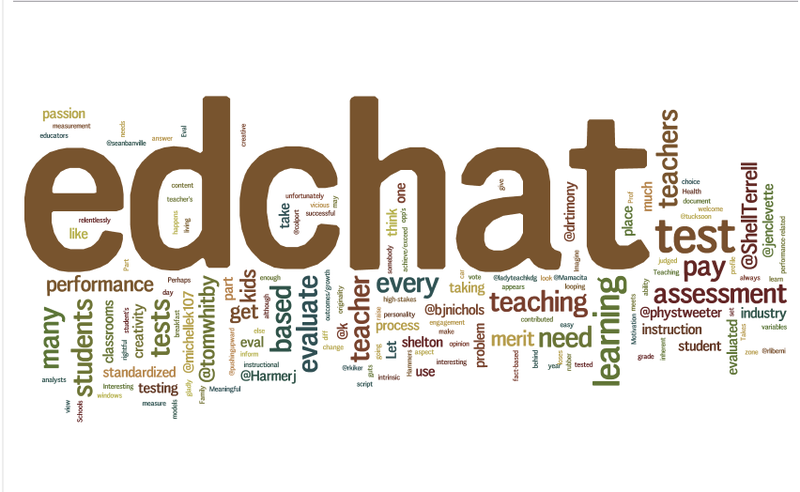 A large number of the comments various edchatters made seemed to me like a call to arms: teachers get involved! Perhaps a politicised movement linked to the PLN is a real chance for change in educational policy and the first step towards really getting teachers’ voices heard? What is sure is that there were some really interesting questions put forward and discussed, some of which you can find below. @andycinek What are we focusing on when we say “a seat at the table” becoming a politician or policy maker or just having a voice? @dlrichert How can teachers go from being viewed as valued stakeholders of schools instead of as employees? @ShellTerrell Agree! RT @JasonFlom: @acluff I think you’re right. So much to do as a teacher. When is their time to learn to advocate? @JaneBalvanz So what if we affected edu policy politically via #edchat? Organize to have a write/ call your senator & representative day. @jeff_shoemaker @weemooseus @tomwhitby do you think a superintendent of a school should have a valid teacher’s licence? @Smichael920 Prob with edu is everyone went to school everyone’s an expert! Policy makers went to school! 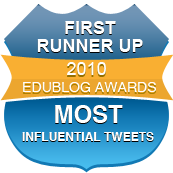 @olafelch I have to say, people, that was the most fascinating #edchat I’ve ever experienced. Thanks to everyone who made it great! As we move forward in the 21st century, what changes need to be made to the way Initial Teacher Training is delivered? How should we teach teachers to teach? Mike Harrison is an ESOL teacher based in South East London. He is getting into using technology in his teaching (in particular online video) and learning a lot about teaching by reading blogs and tweets. See his post on writing this summary!